J.R. Ewing returns to the small screen on Tuesday, and the boys down at the Cattleman’s Club just might need a double bourbon when they hear what he has to say. 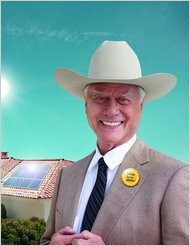 Larry Hagman, the actor who played the scheming Texas oilman on the long-running television show “Dallas,” is reprising his role as J.R. in an advertising campaign to promote solar energy and SolarWorld, a German photovoltaic module maker. “In the past it was always about the oil,” Mr. Hagman says in a TV commercial that is being unveiled Tuesday at the Intersolar conference in San Francisco. “The oil was flowing and so was the money. Too dirty, I quit it years ago,” he growls as he saunters past a portrait of a grinning J.R. in younger days and a wide-screen television showing images of an offshore oil rig and blackened waters. “Shine, baby shine,” he says with his trademark J.R. cackle. In real life, Mr. Hagman, 78, lives on an estate in the Southern California town of Ojai where he installed a massive 94-kilowatt solar system, thought to be the world’s largest residential array, several years ago.